What is the Right Exercise Routine for You? When I was in living China, every morning while the “East is Red” was blaring through the University speakers, groups of seniors would congregate in the courtyards that my dorm balcony overlooked and begin a quiet gentle movement routine. Some were flowing together as flocks of birds, some where following their own movements. 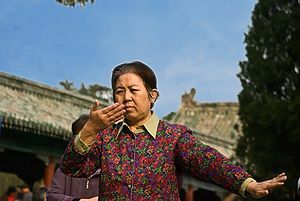 They were practicing Tai Chi or Qigong, both therapeutic exercises rooted in Chinese philosophy. Research has found that TaiChi can reduce incidents of falling in seniors. Even such modest exercise can have great health benefits and increase our lymph flow, an important part of our immune system. In America, we like to take everything to the extreme including being either too sedentary, or too active. Everyday I treat people who are victims of each extreme – overexercise injuries and lack of exercise fallout. There have been a couple of thought provoking articles on overdoing it with exercise in the news lately. One described deleterious outcomes with a user of CrossFit who was hospitalized with rhabdomyolysis, a very serious condition. Cross Fit exemplifies the no pain no gain mentality of fitness that takes us away from the awareness of our bodies and forces us into routines that may not be serving us. Even yoga can be overdone. A recent New York Times article investigated a high incidence of hip replacements in women yoga practitioners. We can use the Chinese medicine lens of YinYang theory to help us understand what our bodies need. I like to think of YinYang theory as a sort of common sense filter. Running, vigorous aerobics and weight training are seen as a Yang exercise – very active and heat generating with more potential for injury. Gentle yoga and Tai Chi are more Yin, or slower, more gentle and with less potential for injury. Power yoga and hot yoga forms are relatively more Yang versions of a Yin type exercise. (Remember the Taiji symbol – even within white there is black and vice versa-even with Yin types there are some that are relatively more Yang). One can still be injured and generate too much heat with these more Yang types of yoga. I do not recommend hot yoga for women experiencing menopausal symptoms such as hot flashing but it may be fine in moderation for colder constitutions. The “Yin yoga” method that has become more popular lately may mislead people into thinking it is safer or more gentle but this style where poses are held for very long times can actually be very challenging and has a greater potential for injury than gentle yoga. Overexercising can be hard on your joints, deplete your Kidney Qi and can hasten osteoporosis (the Kidney is related to the bones in Chinese medicine). We don’t need extreme Yin or extreme Yang types of exercise but a balance of both moderate aerobic and strengthening (Yang) with gentle stretching and contemplative movement styles (Yin) such as gentle yoga and Tai Chi or Qigong. How much Yin or Yang we need can change as we age or when we are recoving from an illness or injury. When we are young we can tolerate more aggressive exercise. The seniors in China know they need to slow down but keep moving. Our exercise routines should be ever changing to reflect our own dynamic natures. What most people really need is some moderate, balanced movement every day. Even just 30 minutes of moderate exercise including walking and 10 minutes of stretching a day can revolutionize how you feel if you are inactive. If you are overactive and have repeated injuries, you may struggle with the idea of reducing your workout but your ability to recover will improve.